Comeau, 52, has spent 18 years coaching in the NLL, which is highlighted by six Champion’s Cup titles, most recently with the Swarm in 2017. After leading the Swarm to a league-best 13-5 regular season record record in 2017, Comeau was named the recipient of the prestigious Les Bartley Award, which recognizes the NLL’s Head Coach of the Year. CLN: What would you say is your most important role as the head coach and why? Comeau: The most important role is being the facilitator amongst our team, all our players and staff, and really creating a culture of communication where we can all be on the same page and work towards the same goal. CLN: Has there been a time where you had to make a decision that hurt the on-the-field success of the team because of a character issue with a player? Comeau: We’ve been pretty fortunate from a character point of view that we haven’t had issues like that. Certainly, in the past, those are tough decisions, but there are certain things that are non-negotiable. As a coach, those are tough decisions and you do them in the best interest of the team and oftentimes in the best interest of the player. CLN: If character is a value, along with winning, how does character translate to on-the-field success? Comeau: Character people in the organization understand, they put the organizational success before their own success. Surrounding ourselves with guys that do that has allowed us to have the success we’ve had by individual performance, but individual performance not for their own benefit. Individual performance for the benefit of the group. That to me is a really big indicator of good culture, where people are willing to play for the team, not just themselves. CLN: Each coach faces the pressure to win while also living up to the values of the organization. How do you handle the pressure for results while also maintaining a culture of integrity? Comeau: People that are successful, teams that are successful, there is no greater pressure than pressure from within, from ourselves and our organization. We try to turn that pressure into a positive thing by making sure that we stay on task and we follow our principles, our core principles and our foundation to success. The external pressures, you can’t control that, and we try not to let that affect us or impact us, but certainly we put pressure on each other to perform, be at our best, and hold each other accountable. ar in 2009 and NLL General Manager of the Year in 2012, and in 2017 after he guided the Swarm to their first-ever World Championship. He is an active alumnus of the University of Notre Dame where he is a member of the Athletic Council, and he was the lead donor for Arlotta Stadium, which is the new lacrosse stadium at Notre Dame. CLN: What has been the biggest struggle in building a winning culture? Arlotta: Time. It doesn’t happen overnight. You have drafts, and you have to build a team with players you can learn about. When you’re trading for players, you don’t always know about them, and it may be that somebody’s actually a cultural problem, which is why someone’s trying to trade them. But when you’re drafting, and we decided to draft, we have an opportunity to talk to players and their coaches in advance of drafting them. So, it took some time. It wasn’t going to happen overnight because you can’t bring an entire team of high character players in overnight. Where we did want to make trades for certain players that we knew had the right character as well as the right talent, that doesn’t happen overnight either. It takes time. So, assembling the team in a way that you have assembled a team with a winning culture just takes a little bit of time. It doesn’t happen overnight. CLN: What was the process of hiring like-minded coaches to be a part of your organization? Arlotta: There are elements of like-mindedness that you want as a general manager in a coach. General philosophy of how you play and therefore the athletes or players that a general manager has to get. It’s good to have a similar philosophy. In our case, fast, athletic players with a high stick skill level both offensively and defensively is what we look for. In hiring Ed, we’re like-minded from the perspective of the type of players and the system that we would play with the type of player. So that very much is like-minded. On the other end of the spectrum, you want to have some differences in the way that you think. And so, being totally like-minded on everything is in my mind the best. Getting a diversity of opinion and thought on other topics that aren’t as big picture, that’s an important element to have as well. I think an example of that in my case would be that the way that they run a practice or prepare a team for a game, we can have some differences of opinion and it doesn’t necessarily have to be a bad thing. My opinion might be one in one case that would work, and, in another case, as we talk it through, it wouldn’t work. I think that would be an example on the other end of the spectrum. So, you want like-mindedness in terms of overall philosophy, strategy, and approach, but the tactics, you don’t necessarily have to have like-mindedness, and you, in fact, want a little diversity, because diversity of thought is going to get you a better result. CLN: What was the benefit to your team once your coaches were aligned in philosophy? Arlotta: We have been building the team with the philosophy I just described and adding to that players with high character, and so we didn’t necessarily have to start from scratch in hiring coaches and building a different kind of team. CLN: Of all the different values coaches can bring to a team, why was building character the one you valued the most? Arlotta: Several reasons. One, I truly believe that you win with character players. You don’t have as much discord in the locker room. You have a consistent approach. You have fewer problems off the floor and on the floor. That would certainly be one reason. And secondly, like in any other business, you want to enjoy what you’re doing, have fun, and when you have players of high character, you know you’re going to enjoy the process with them, going through that process, both the winning and the losing. It has to be fun, as well, and I wouldn’t have much fun with players that didn’t have high character. I really don’t think that way and believe in that. CLN: What are the two most important lessons you have gleaned from building a coaching staff? Arlotta: The first is that coaching really matters. We have our players for so little, a small amount of time, that a well-organized coaching staff that can impact and really teach players makes a big difference here. The ability to do that and do it well and do it quickly in a coaching staff was really important. When we had a coaching staff that wasn’t as good, even though we were already developing a pretty good group of players, we didn’t succeed as much. Once we got the great coaching staff along with the players, then the success went up significantly. That’s one of the important lessons. The other is chemistry with the coaching staff itself. Diversity, and at the same time, chemistry. So, having different ideas, thoughts, and opinions and experiences on the coaching staff I think is really important, but also having them very much together and of one mind and working well together is equally important. The Georgia Swarm Pro Lacrosse team is a member of the National Lacrosse League (NLL), which is North America’s professional indoor lacrosse league featuring the best players in the world. 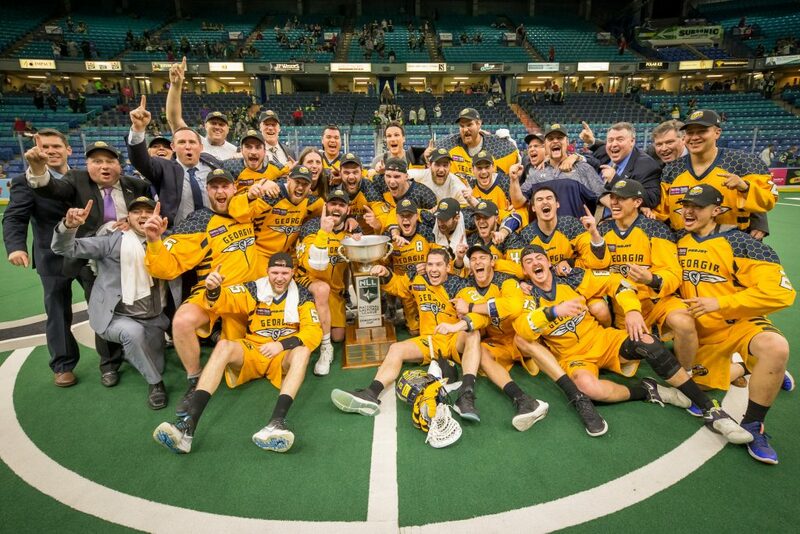 In 2017, the Swarm became NLL World Champions after a historic 17-5 season. Founded in 1986, the NLL ranks third in average attendance for professional indoor sports worldwide behind only the NHL and NBA. The league is comprised of 11 franchises across the U.S. and Canada and the 2017-18 NLL season marks the league’s 32nd year. 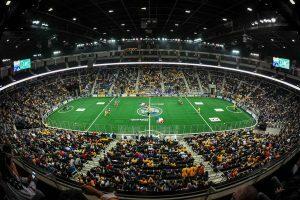 The Swarm competes in an 18-game regular season schedule from December to April, and plays their home games at Harrah’s Cherokee Casino Field at Infinite Energy Arena (Duluth).